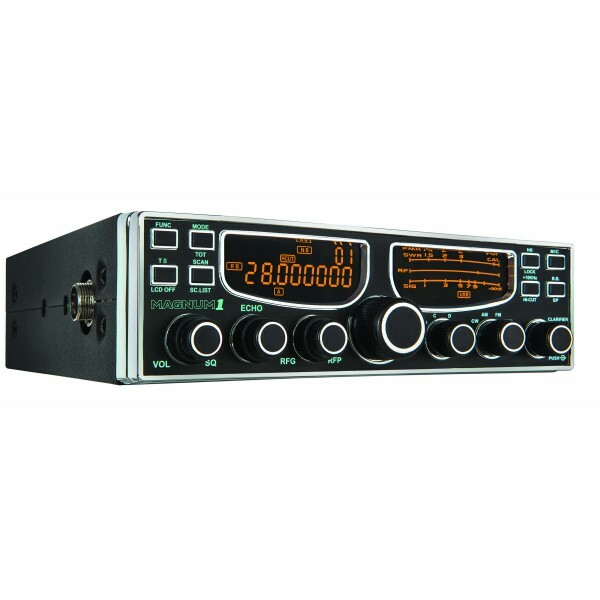 24.890 ~ 24.990 and 28.000 ~ 29.700 MHz Coverage Continuous Coverage Receiver 24.500 ~ 29.999. 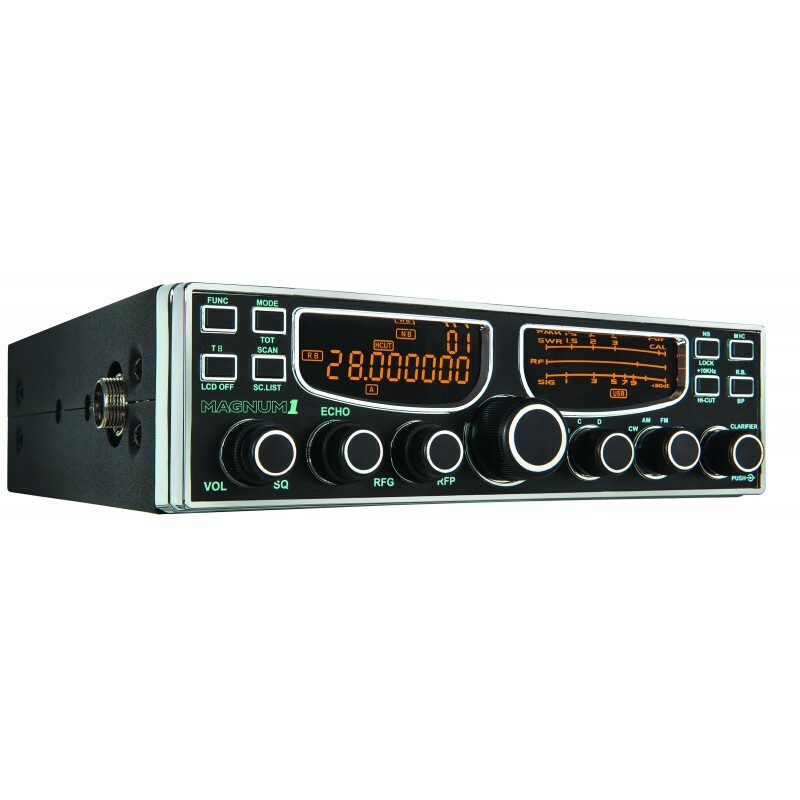 All Mode - AM / FM / USB / LSB / CW / PA.
50 Watts PEP Output Power / Dual ERF2030 MOSFET Finals / Variable RF Power Out. Temperature Compensated Crystal Oscillator (TCXO) / Rock Solid Frequency Stability / 20 Times More Stable than XO. Digital VFO - 5Hz Resolution. Digital Echo Volume & Delay and Variable Talk Back. Programmable Roger Beep - Tone & Duration. RX Audio Tone Control (Hi-Cut). 3-Button Stock Microphone - Up/Down/ASQ. Real-Time SWR Meter - Continual Reading. Multi-Mode Clari_er - RX Only / TX Only / RX & TX. Frequency Scan - Squelch & Time Operated. PA Mode with Volume Control. Frequency Coverage : Transmit and Receive ............. 24.890~24.990 & 28.000~29.699 MHz. Antenna Impedance : 50 ohm, unbalanced. Frequency Control : Digital Phase-Lock Loop (PLL) Synthesizer. Temperature Range : -30 to +50 Degree C.
Power Requirement : 12 - 13.8 V DC, Negative Ground. Current Consumption : 9 Amps Maximum. Power Output : SSB: 50 Watts / FM/CW: 20 Watts / AM: 1-10 Watts Average 50 Watts PEP. Tuning Steps : 5 Hz / 10 Hz / 100 Hz / 1 kHz / 10 kHz / 100 kHz / 1 MHz. Final Transistor : ERF2030 (x2). Spurious Emissions : More than 50 dB below Peak Output Power. Carrier Suppression : More than 55 dB below Peak Output Power. Unwanted Sideband : More than 50 dB below Peak Output (1 kHz tone). FM Deviation : +/- 2 kHz Maximum. Audio Response : More than 30dB below Peak Output. Frequency Response : 300 to 3000 Hz. Microphone Impedance : ECM, 2.2K ohms. Circuit Type : Dual-Conversion Superheterodyne. Sensitivity : SSB: 0.25 μV at 10 dB S + N/N. / AM: 1.0 μV at 10 dB S + N/N / FM : 0.3 μV at 12 dB SINAD. Selectivity : SSB: 6.0 kHz (-6 dB) / 3.3 kHz (-60 dB). / AM / FM: 6.0 kHz (-6 dB) / 9 kHz (-60 dB). Clarifier Range : Continuous (Digital VFO). Adjacent Channel Rejection : Better than 70 dB. IF Rejection : Better than 80 dB for all Frequencies. Frequency Response : 250 to 3000 Hz. Audio Output Power : 3 Watts Minimum at 10% THD with an 8 ohm load. Audio Output Impedance : 8 ohms. 1 Pc of Stock Microphone. 1 Pc of DC Power Cord with Inline Fuse. 1 Pc of Mounting Bracket with Hardware. 1 Pc of Microphone Hanger with Hardware Set. 1 Pc of Operating Manual with Schematic.